Your preferred weapon should be distinctive, styled to suit your tastes. If you happen to love the way a saber works in battle and the image of a dragon attacking its prey, then this Silver Dragon Saber is the weapon for you. This stainless steel blade is a traditional straight-edged saber design, possessing a single edge with a point that makes it effective at cutting and skewering. The real detailing comes on the hilt and sheath. 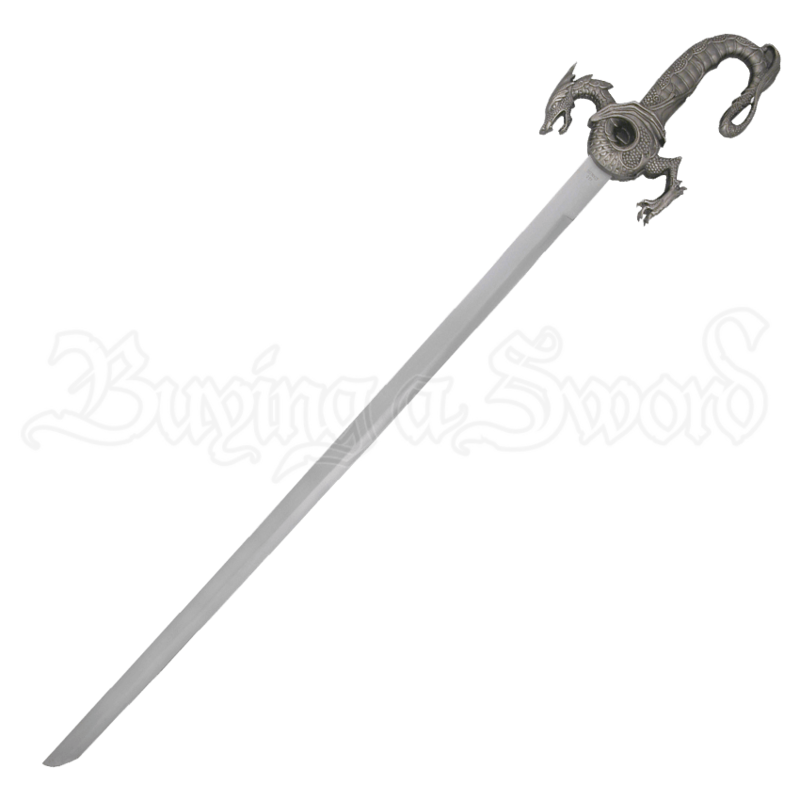 The hilt takes the shape of a full-bodied dragon, with the guard being made up of the dragons head, neck, chest, and legs, while the dragons tail extends out from the back, creating a textured handle as well as an up-turned partial hand-guard. Thanks to the dragons feet being a part of the guard, this saber can also stand on its own and requires only a flat surface to be displayed. The sheath is equally impressive, featuring matching dragon designs along its metallic length as well as a small attached chain. The sword has an overall length of 35.5 inches with the blade measuring approximately 28 inches long. Secured to your belt, this sword would be the perfect weapon with which to lead a charge into battle, and, when not at your side, this Silver Dragon Saber makes one amazing piece to display in your home.